Riding east from Mirleft we rode through some unbelievably rugged and increasingly barren landscape. 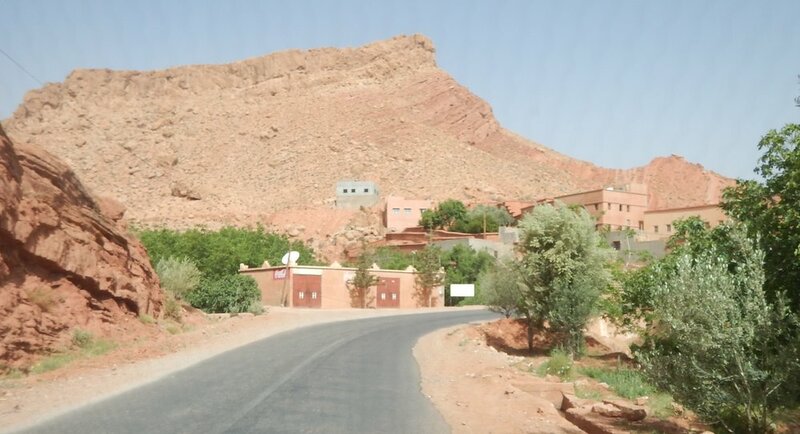 Tough life for the Berber and Tourheg families trying to eke out an existence from this land. More photos following, of this stoney country. It was spectacular in its ruggedness. just look at the contour lines, they are all over the place. Real More Rock n Roll countryside !!! And then came the desert!! Sandstorms everywhere you looked. Half the road was covered in sand and then when it clears we find we are on the edge of the Sahara. 40 km from Algeria!! Bikes were parked up. Phew. That's a good idea as we were literally melting into the road, sandpaper like!!! Dinner under the stars. Jupiter and Venus were the only constellations I recognised. No Southern Cross boo hoo.